I am back again with another one-pan meal! 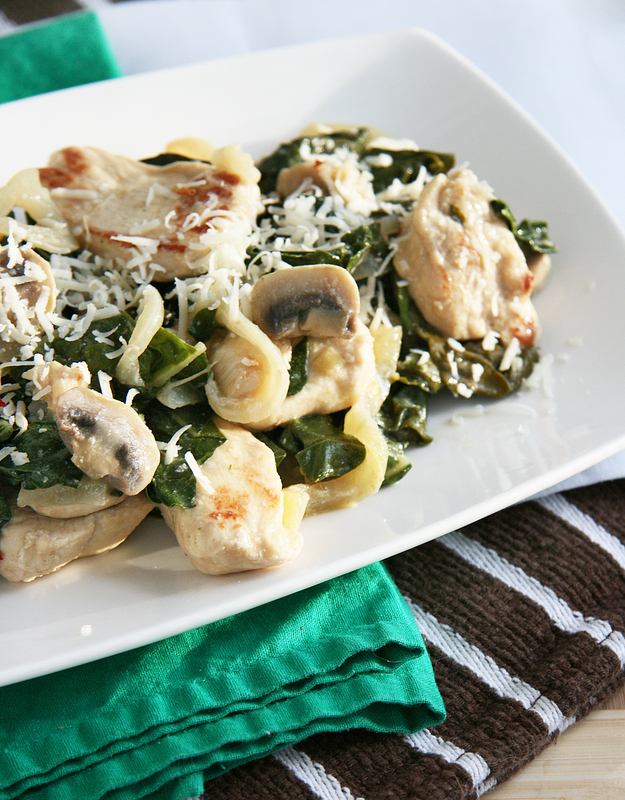 Swiss chard, lemon, mushrooms and chicken make up this rustic skillet dish that is packed with nutrition. We ate this alone for a lighter meal but feel free to serve your favorite cooked grain alongside for a bit more bulk…cooked gluten free pasta would also be delicious tossed in along with the lemon juice and fresh herbs! 1. Toss chicken and onions with brown rice flour and season with salt and pepper. Set aside. 2. In a large skillet, heat oil/butter over medium-high heat. Saute chicken and onions for 7-8 minutes or until chicken is cooked through. 3. Add garlic and cook for 30 seconds or until fragrant. Stir in chicken broth and cook for 1 minute. 4. Add mushrooms, greens and crushed red pepper. Cover and cook for 4-5 minutes until greens are wilted. 5. Stir in lemon juice, zest and fresh parsley and remove from heat. Transfer to serving dishes and top with 1 1/2 Tbsp of shredded cheese per plate. Season with salt and pepper if needed. Serve immediately and enjoy! 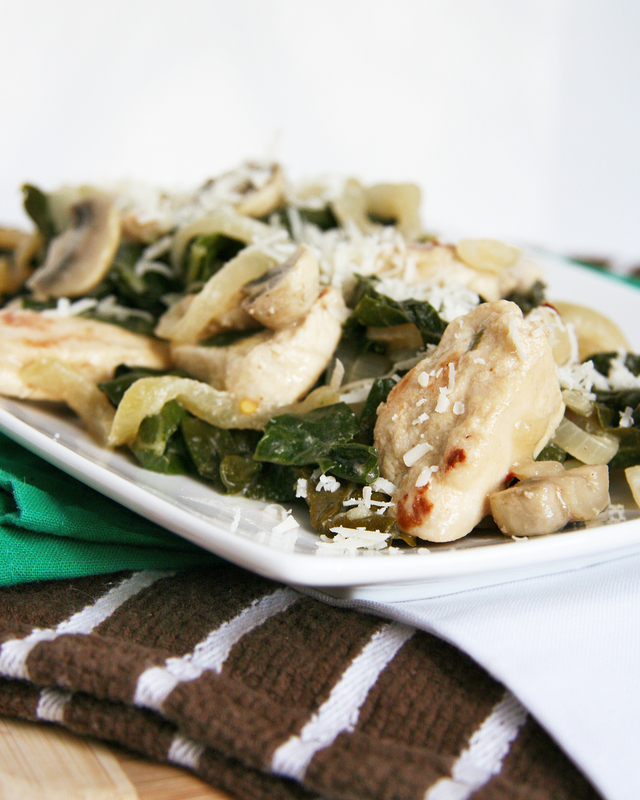 Oh love the combo of chicken, chard, and mushrooms! 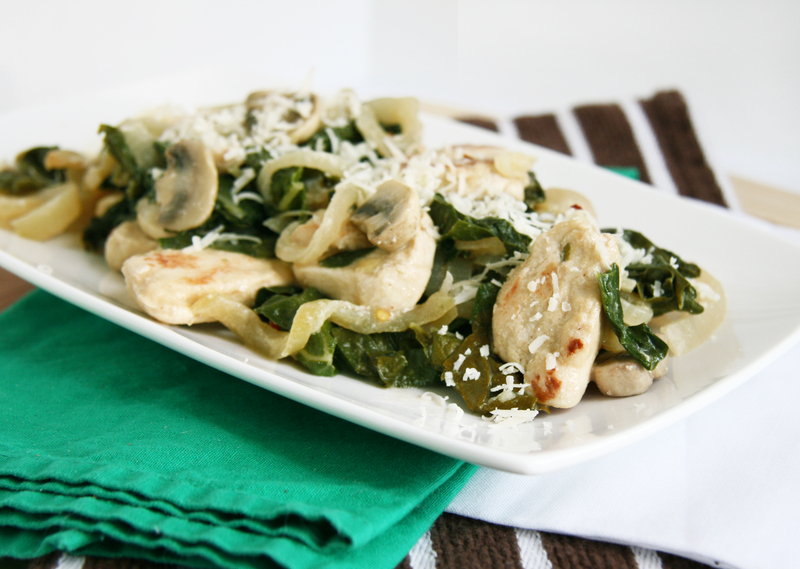 I’m always looking for new ways to cook greens. Def pinned this one! I am sucker for mushrooms and greens 🙂 Glad you agree with me! Thanks for pinning!